Every summer at Camp Perry, Ohio, prior to the National Rifle and Pistol Trophy Matches, soldiers from the U.S. Army Marksmanship Unit (USAMU) take time to pass their knowledge on to the next generation of American shooters. The Small Arms Firing School (SAFS) was instituted in 1918 by the Dept. of Defense. SAFS is now run by the USAMU, with help from other U.S. Military and National Guard personnel. The SAFS is divided into pistol and rifle programs. The Pistol SAFS will be held on Monday, July 9, 2012, while the two-day Rifle SAFS will be held July 28-29, 2012. There are two divisions for rifle shooters — a basic program for novice/intermediate shooters, plus an Advanced Service Rifle Course for experienced marksmen. Both rifle programs finish with special M16 EIC Matches. 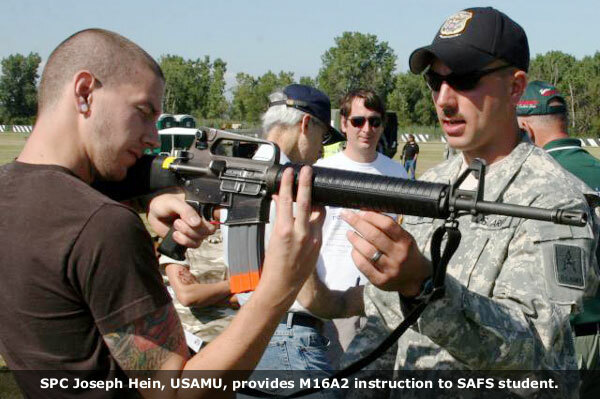 The SAFS program is very popular, drawing over 1,000 participants to each year’s rifle and pistol classes. Fees for the Rifle School or Pistol School are a modest $45.00 for adults and $30.00 for juniors. The USAMU provides semi-auto-only M-16A2 rifles for the students to use. The USAMU also supplied pistols and ammo for the pistol students. CLICK HERE for registration and more information. The day starts with classroom instruction and covers everything from the functioning of the weapon to proper positioning. The instructors, such as 2009 National Pistol Champion SFC James Henderson, are among the best in their respective shooting disciplines. After a few hours in the classroom, the students trek to the range and get a feel for the weapon in dry-fire simulation. There are two students per military instructor. Upon their return from lunch, students go to the range for live-fire practice. 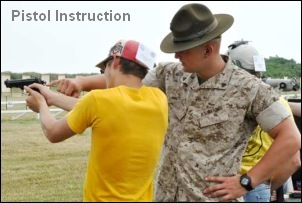 Persons from all walks of life, young and old alike, have participated in the pistol and rifle Firing Schools. The students range in age from 12 to 70. 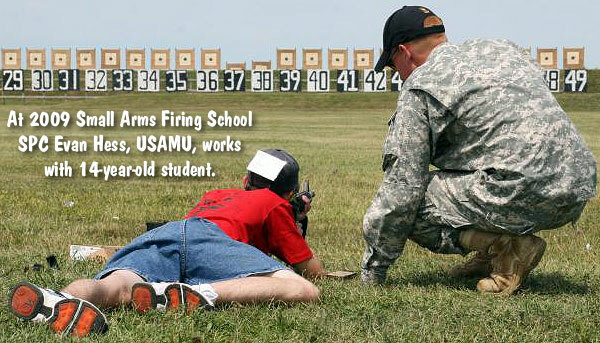 (Minimum age for Rifle SAFS students is 12; minimum age for Pistol SAFS students is 14.) State junior shooting teams showed up, families planned their family vacations around the trip to Perry, and others flew long distances to learn from the elite marksmanship instructors. This story is based on a report by Michael Molinaro, USAMU public affairs officer. Share the post "USAMU Conducts Small Arms Firing School at Camp Perry"
The CMP National Trophy Matches will kick off July 9th with the First Shot Ceremony. 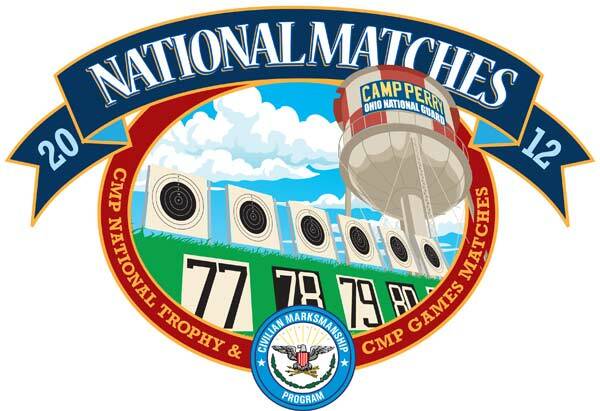 The official program and registration information for the CMP National Trophy and CMP Games Matches at Camp Perry, Ohio, are posted on the CMP website’s National Match Page. The National Matches are conducted by a partnership between the CMP, NRA and Ohio National Guard. The National Matches are open to the public and visitors can stop by the National Matches Welcome Center, Building 3, at Camp Perry throughout the matches for information. The colorful First Shot Ceremony will be held on Monday, 9 July, at 10:00 AM with a Military Band Concert starting at 9:30 AM. This year’s First Shot Speaker, LTG William E. Ingram Jr., Director Army National Guard, has the honor of firing the First Shot to officially open the 2012 National Matches. Public viewing from bleacher seating is open to the public and encouraged. Highlights will include a color guard, a military band and a National Guard combat maneuver. This year’s National Match competitors will enjoy the newly rebuilt Rodriguez Range berm and target pits. 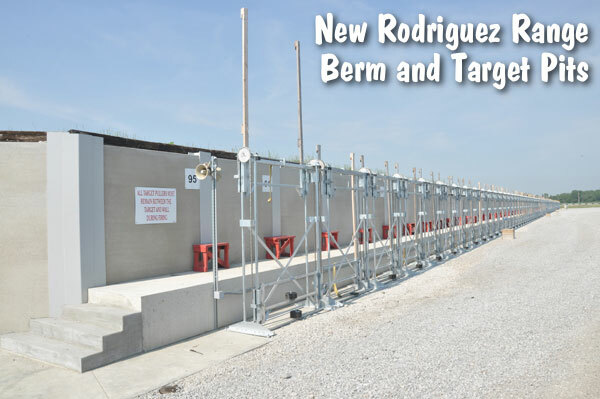 The State of Ohio hired local contractors to rebuild the Ohio National Guard’s 100-year-old range this past winter. The CMP purchased and installed a new speaker system in the pits. Share the post "2012 National Trophy Matches and CMP Events Start July 9th"